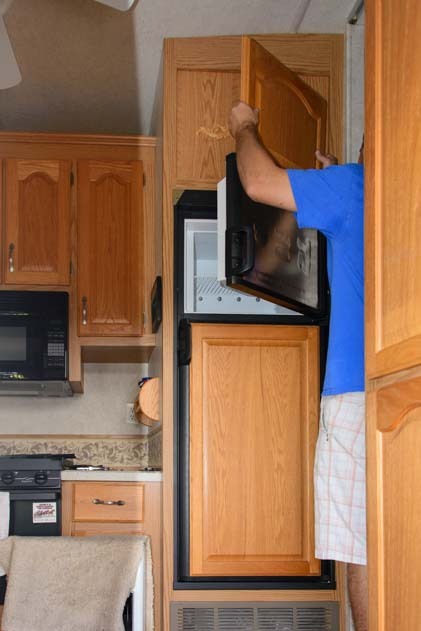 RV Refrigerator Replacement – How an RV Warranty Saved Our Bacon! 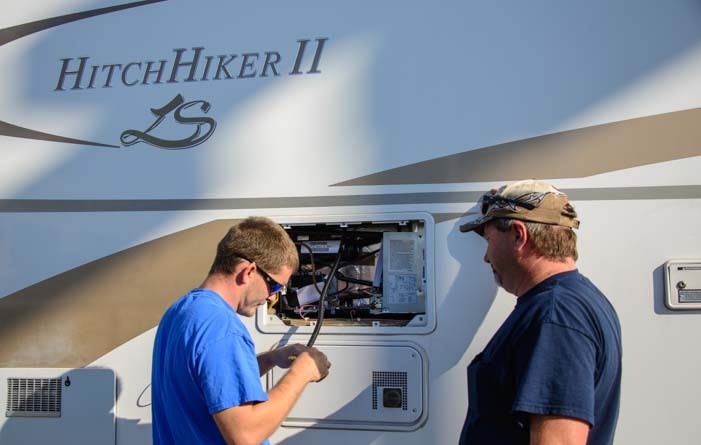 We’ve been reporting on whether or not an RV warranty is a good investment for RVers, and this page — the second of four installments — presents our latest findings. Ten days ago, after a fabulous two weeks in Maysville, Kentucky, and a long day of driving, we set up camp, grabbed a beer, and kicked back to enjoy a cold one. But to our dismay, the beer was kinda warm. 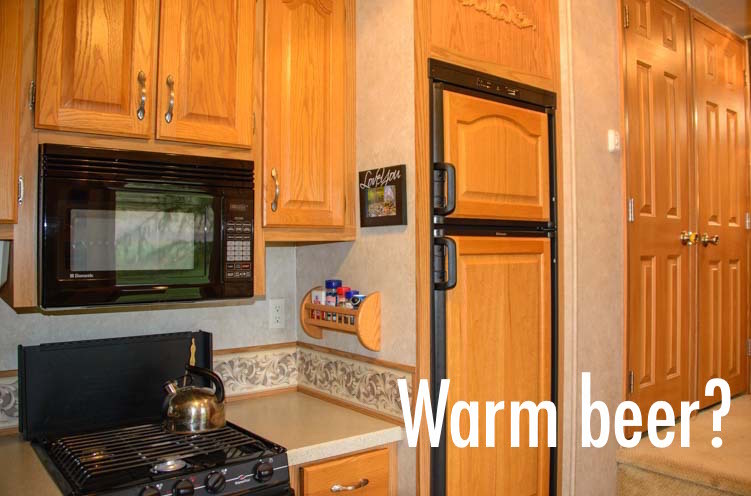 We ratcheted the RV refrigerator up a notch and went about our business. After dinner and a movie in our RV, we decided to have a bowl of ice cream. When Mark lifted the lid on the Haagen Dazs, what he found inside could only be described as cool chocolate soup. Oh no! Our 8 year old RV refrigerator had died. Do something quick! We’re going to lose everything in the fridge and freezer!! As the clock neared midnight, we began a frantic search for RV repair shops in the area. We put together a list of them, went to bed quite distressed, and first thing the next morning we started making phone calls. Mark threw bags of ice in the fridge and freezer and we didn’t dare open either door after that. We lamented sadly that all our frozen meats — all those nice burgers and steaks, and even our bacon, darn it — were quickly defrosting. After about 15 phone calls, we were still nowhere. Everyone told us it would be a two week wait to get a fridge and that it would probably cost upwards of $1,500. Finally, we called Camping World just south of Indianapolis. They had an identical unit in stock and they could squeeze us in for service the next morning. They told us they always try to make an extra effort for desperate travelers passing through. Well, we weren’t exactly passing through. We were in Kentucky driving west towards Tennessee, and they were 150 miles to the north in the totally wrong direction. But what can you do? We were absolutely thrilled to find an RV repair facility that had an RV refrigerator in stock and could install it quickly, so a 150 mile detour was not a problem! This would be our second major repair in just over a month. We had just had our 36′ fifth wheel trailer axle replaced. What’s worse, we were actually on our way to an RV repair appointment in Kansas to fix a leak in our fresh water tank. What kind of luck was that? As it turns out, Lady Luck was following us very closely. Our RV extended warranty had covered the bulk of the trailer axle repair, and we were pretty sure it would cover this one too. You can see the current status of our warranty HERE. 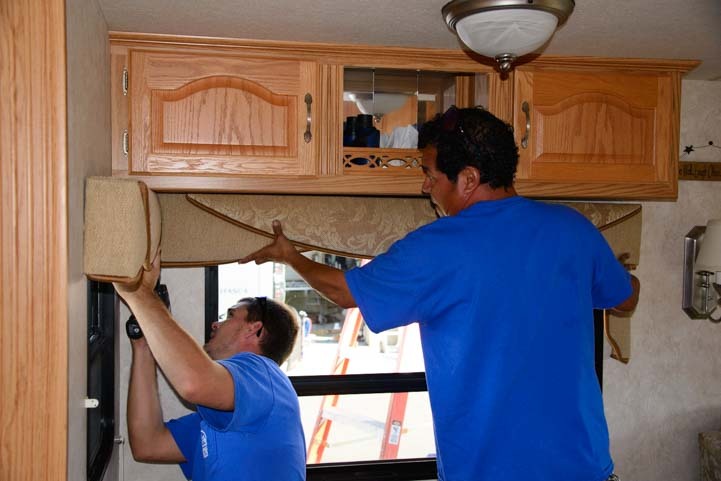 It looked like this RV warranty repair would not only bring our total reimbursements to the point of covering the original cost of the RV extended warranty but would go well beyond that. 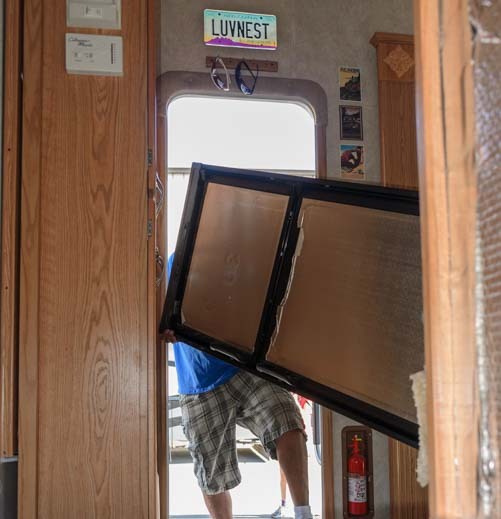 18 hours after we’d discovered our fridge was dead, Camping World service manager Rick Helvey was in our trailer examining its hulking carcass. He told us that propane RV refrigerators typically last only 10 years. It was no surprise to him that our 8 year old unit had kicked the bucket. 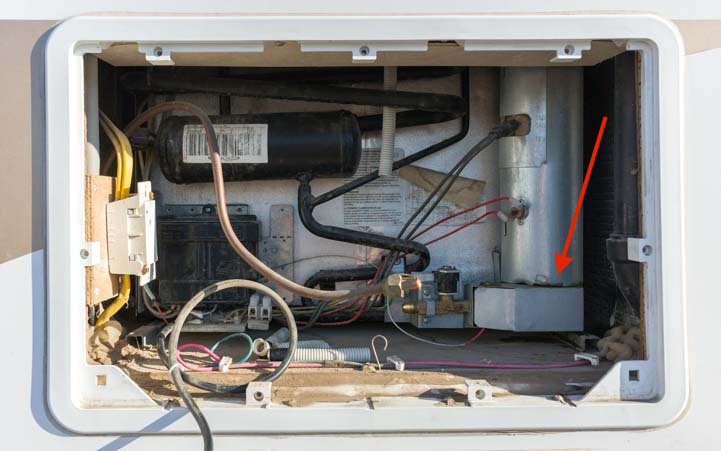 He opened the fridge vent on the outside of the trailer and showed us the telltale signs of a dying RV refrigerator: greenish or yellowish dust. The presence of this dust meant the ammonia was leaking out and the cooling unit had given up the ghost. The crazy thing is that the price of a cooling unit is nearly the same as the price of a new RV refrigerator — Not Cheap! 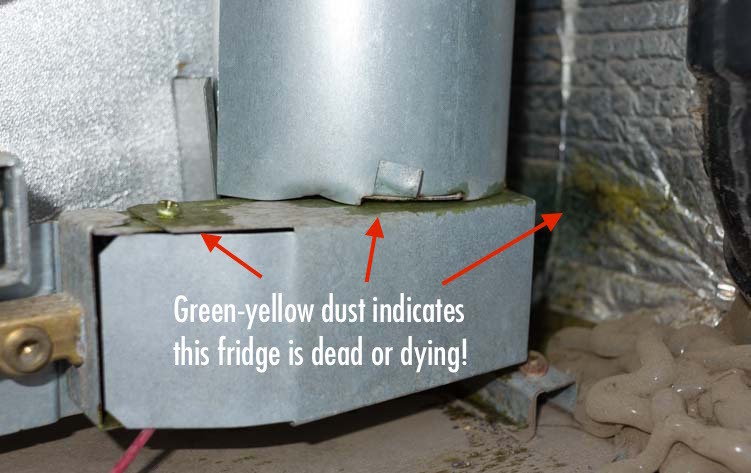 Yellowish dust in the fridge vent area is proof positive that the fridge is dying. Here is a closer look at the greenish – yellowish dust. This was a problem — for us and for Camping World!! If we got our refrigerator replaced, we would be in and out of Camping World in 3 hours the next morning and they could go back to business as usual with their local customers. If we had to have the cooling unit replaced, we would have to wait a week or two for the part to come in and Camping World would have to reshuffle their appointments the next morning, once again, because our appointment was already on the books. We had all assumed the approval of a replacement refrigerator would be a slam-dunk. Our new refrigerator is ready and waiting — all we need is approval to install it! Well, here’s one reason we are becoming more and more enamored of our RV extended warranty through Wholesale Warranties. Unlike most warranty brokers who wash their hands of the deal once you’ve purchased the contract and signed on the dotted line, they are willing to go to bat for you if the warranty reimbursement process isn’t going as smoothly as it should. We called Wholesale Warranties and told them what was going on. The difference in cost between repairing and replacing was not astronomical. Couldn’t the warranty company allow us to go ahead with the refrigerator replacement? Within an hour they had called our warranty company, Portfolio Protection, explained to them why it made more sense for everyone involved to install the new fridge Camping World had in stock and, magically, our refrigerator replacement had been approved. We were floored that Wholesale Warranties would do this and that they could be such effective facilitators. Yet it turns out that making these calls is business-as-usual and is routine customer support for them. 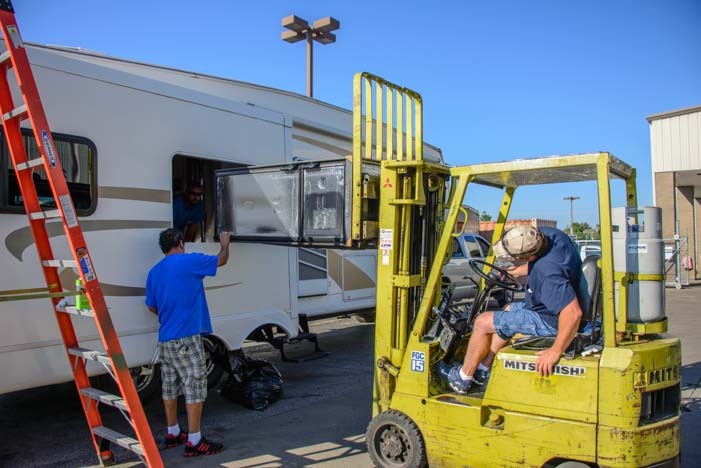 Early the next morning we parked the fifth wheel in front of Camping World, and service technician Raymond and his assistant José got started on it right away. Unfortunately, our old refrigerator was 1/4″ too wide and could not fit through our front door. RV refrigerators are installed at the factory before the doors and windows are in place! Good heavens, the old fridge can’t go out the front door! So, the dining room window had to come out! so the refrigerators can be hoisted in and out. It would have been so much easier if the refrigerators could have gone through the door! The new fridge is ready for some strong person to pick it up! A forklift was used to remove the old fridge and hoist up the new one. It was at this point that I realized just what a challenging DIY project this would have been for Mark! Thank goodness for fork lifts! This is not an easy DIY installation for one guy! Then the new RV refrigerator was put in place. Raymond settles the new refrigerator into place. The pretty oak panels from our old refrigerator were slipped into place on the new door. Our oak panels from the old fridge slide neatly into place. Then Raymond ran around back to hook everything up in the refrigerator vent. The back of the new fridge is exposed in the vent area where Raymond hooks it all up. The wall has to be completely clean for a good seal on the window. Raymond lifted the window into place, and he and José screwed it in place. Raymond puts the window back in place. 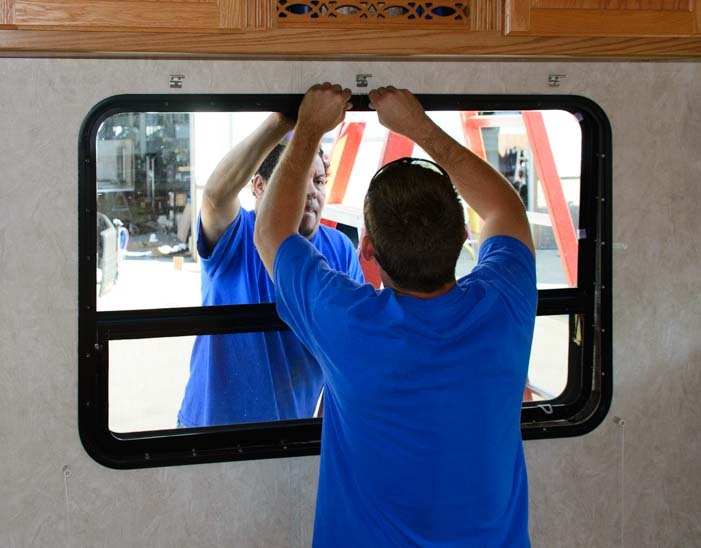 The guys work together to get the window screwed into place. 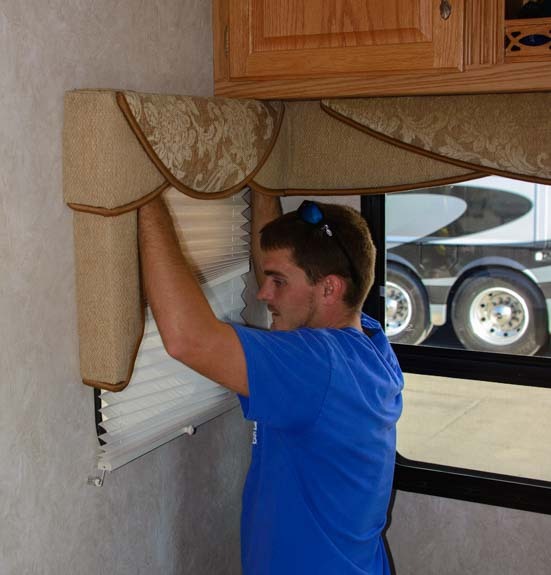 Then they remounted the window valence and reinstalled the day-night shades. The window valences are reinstalled over the windows. The day-night shades are reinstalled on both windows. Raymond gave us instructions not to put a bead of silicone around the window frame for about a week because he had used caulk tape that would ooze a little for the next few days. We were impressed with how quickly these guys worked and got the job done, and we were really grateful to Rick for making an opening for us. In just 36 hours from the time we had soup for ice cream, we had a brand new RV refrigerator up and running. Now we just had to wait for it to cool down (about 9 hours). In the meantime, our frozen meats had fully defrosted but were still cold. We couldn’t re-freeze any of them when the refrigerator finally cooled down. Arghhh! As we hitched up the fifth wheel, I noticed Mark had a twinkle in his eye as he drove it around to the back lot. He hopped out and instantly set up the barbecue, right there in the Camping World parking lot. He happily began grilling burgers, hot dogs, steaks, chicken and brats. “We can’t let all this good meat go to waste!” He said to me as he handed me the bacon and sent me inside to fry it up. 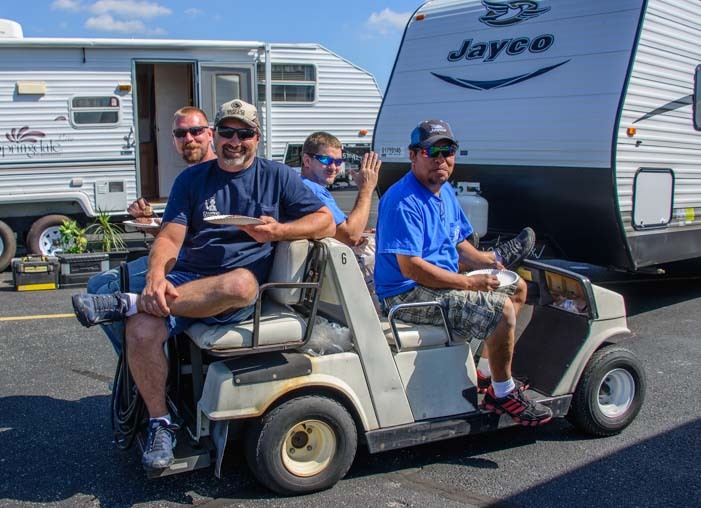 It turned out he’d invited the service guys to come on over to our place for a barbecue lunch, and when the yummy smells from our grill began to waft across the Camping World parking lot, they quickly showed up in a golf cart and began chowing down. The Camping World service team stops by for an impromptu barbecue. Thank you guys for a super job! At last it was time to settle up the bill with the service manager, Rick. Our RV warranty deductible was $100. Indiana charges sales tax on deductibles, so our total out of pocket cost for this phenomenal repair was only $107. Wow!! 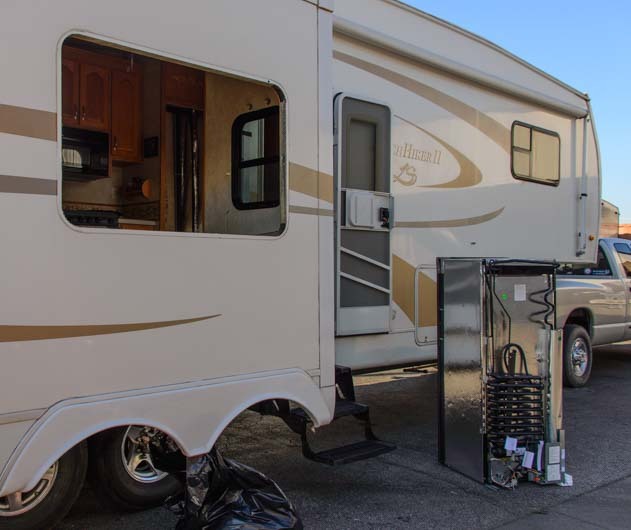 Our RV warranty (less our $107 deductible + tax) covered $1,647 on this one repair alone — that is nearly the cost of the entire four year RV extended warranty itself! Are we happy with our extended trailer warranty? OMG Yes!! 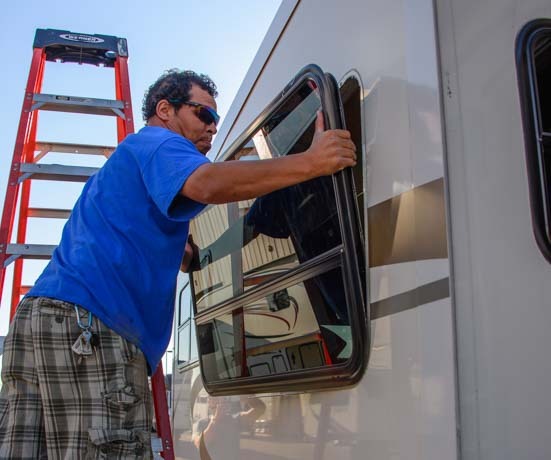 Having suffered four major repairs in four months, we have come to the conclusion that anyone with an RV older than four or five years should seriously consider getting an RV extended warranty, especially if they don’t like unexpected financial surprises. What a shock it was to find out that RV refrigerators are expected to fail by their tenth year of service. All you need is that one repair plus another one or two (air conditioner, water heater, furnace, slide-out mechanism, hydraulic leveling system, etc.) to cover the cost of a four year warranty and even wind up ahead. Do I sound enthusiastic and excited about our trailer warranty? I am!! I was hugely skeptical about RV warranties before our trailer axle and RV refrigerator replacements, and all I can say is that this has been an amazing process!! The discount comes off of the quoted price at the time of purchase — just be sure to ask! 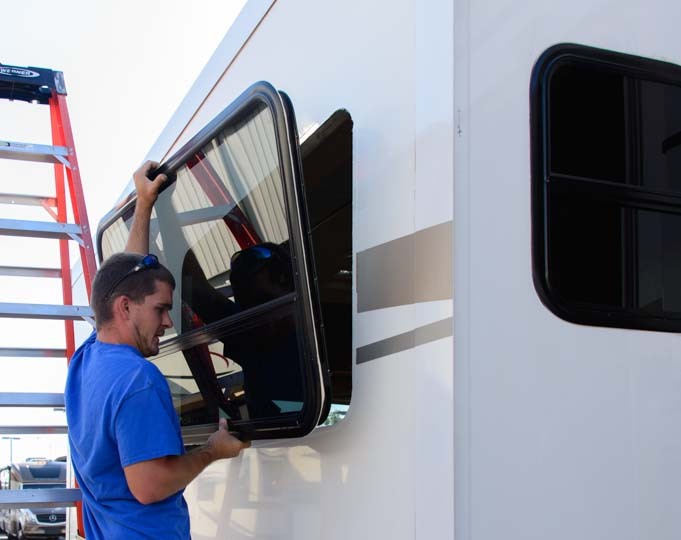 What Is An RV Warranty and Is It A Good Investment? 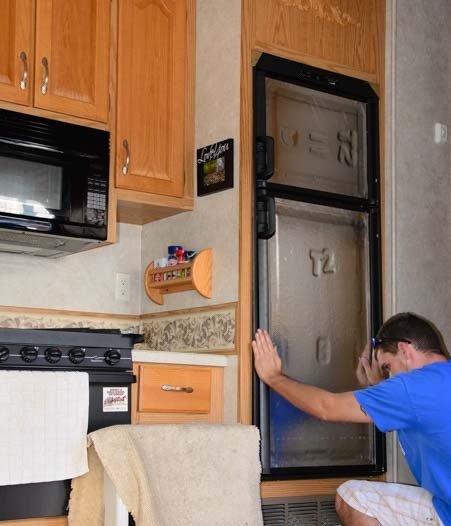 Can a Residential Refrigerator Run on Solar Power in an RV? 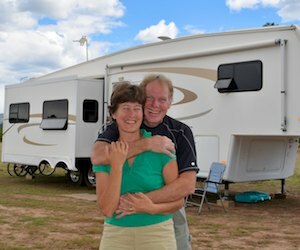 This entry was posted in The Full-time RVing & Cruising Lifestyles and tagged Full-time RV Lifestyle, New, Non-Travel, Popular Articles, Truck Trailer Hitch by Roads Less Traveled. Bookmark the permalink. I haven’t written a post about loading up an RV with breakables or how to pack an RV for traveling, but that is a good idea. We use rubber shelf liner to keep things from slipping around, space our ceramic mugs apart so they don’t touch, and put soft things like dish towels between glass items that are stacked (like empty storage containers). We don’t have wine glasses, but many RVers do (on our boat we wrapped our wine glasses and wine bottles in towels). We place glass containers of things like balsamic vinegar between plastic containers of things vegetable oil. Getting your new-to-you fiver checked out by the manufacturer’s service facility is an excellent idea. Good luck with it all — what a thrill for yoU! What we’ve used on our boat and in the fifth wheel is industrial strength velcro sticky tape. You can see it here: http://amzn.to/1RmYvFz It’s a fairly permanent solution, because peeling it off will take the fiver wall covering with it. That didn’t happen with the boat’s bulkheads because they were made of an unbelievably impervious material. 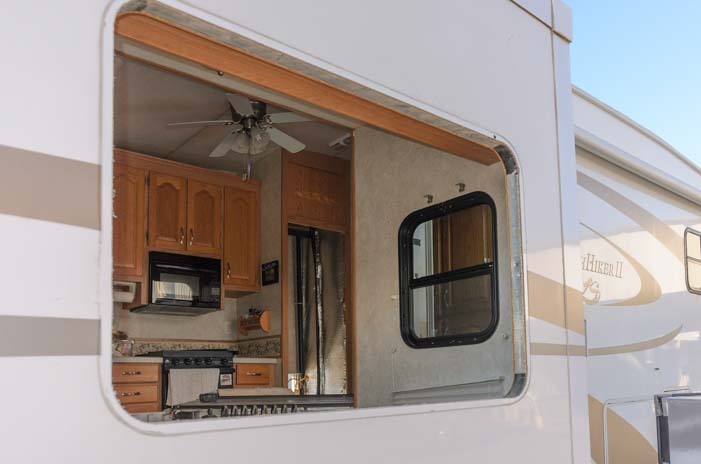 Most of our 5th wheel decorations are unframed and are slid into the slots between the trim wood on our slide-out frames and on some cabinetry. Hardly “Better Homes & Gardens,” but it works! HI Mark & Emily, I’m purchasing a new 5th wheel on Saturday (12/30) and the dealer is suggesting I purchase an extended warrantee through them, from Protective Asset Protection. It’s a 6 year extended warrantee, that starts after the mfr. 1 year warrantee ends. The cost is $35.20 per month added to my 180 month contract. Which translates to $6336.00 total cost. This seems like a lot to spend on a brand new rig. My question to you is, are you familiar with this product: XtraRide Platinum Coverage by Protective Asset Protection , is it worth the price and if not do you recommend another product that I should consider before I make my decision? 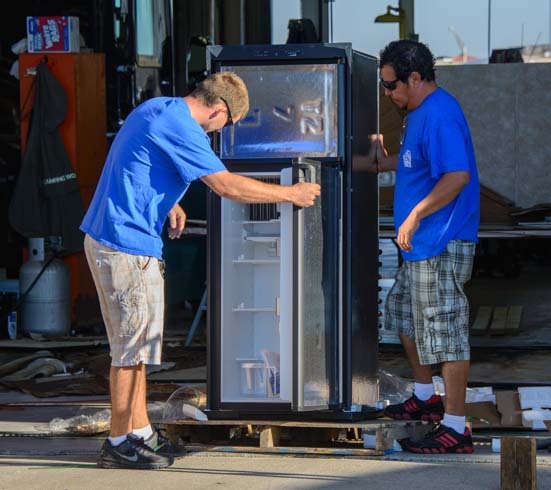 As you can see from the article on this page about our refrigerator replacement, our trailer warranty is through Wholesale Warranties, and that is the warranty we recommend you buy. If you don’t know much about them, check out all our other blog posts about our experiences with Wholesale Warranties here (trailer axle), here (leaks), here (suspension) and here (toilet). We have been extremely happy with their service, as you can see from the tales of systems failures and replacements we’ve lived through with them. You can get a quote from them here, and if you indicate you heard of them from Roads Less Traveled, they’ll drop a little something in our tip jar and give you a $50 discount, as explained above (just above the “Subscribe” button). Good luck, have a blast in your new rig (what fun! ), and let’s hope you never need to use your warranty!